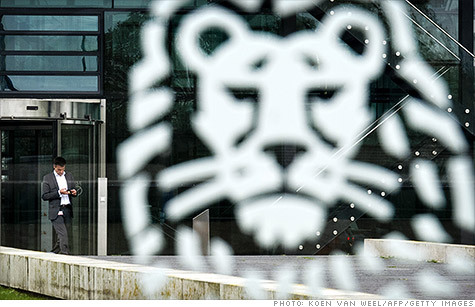 ING will pay a $619 million fine. NEW YORK (CNNMoney) -- ING Bank has agreed to pay a $619 million penalty for moving billions of dollars through the U.S. financial system at the behest of Cuban and Iranian clients, acts that violated economic sanctions. In addition, the Dutch bank admitted to falsifying the records of New York financial institutions, according to the Manhattan District Attorney, who was joined by the Department of Justice in announcing Tuesday's settlement. The fine is the result of a two-year investigation conducted by numerous federal agencies, as well as authorities in New York and the District of Columbia. The penalty is the largest ever recorded for sanctions violations. "These cases give teeth to sanctions enforcement, send a strong message about the need for transparency in international banking, and ultimately contribute to the fight against money laundering and terror financing," Manhattan District Attorney Cyrus Vance said Tuesday in a statement. Authorities say ING (ING) moved money from Cuban and Iranian clients through New York banks, while deliberately shielding the transactions through the use of less transparent payment methods and shell companies. Sanctions prohibit individuals from certain countries -- including Iran, Sudan, Cuba and Burma -- from accessing the U.S. banking system. ING, which had previously disclosed the investigation, said it has taken various steps to "strengthen global compliance risk management," and has since closed its representative office in Cuba. "The violations that took place until 2007 are serious and unacceptable," Jan Hommen, CEO of ING Group, said in a statement. "The facts as compiled in the statement of the Department of Justice describe a very different ING than the company we're all working so hard for today," he said. The bank said that its discussions with authorities did not involve ING's Insurance and Investment Management operations, its retail banking arm or ING Direct, which has since been sold.